The U.S. economy ended 2018 on a strong note, adding a ten-month record-breaking 321,000 jobs in December. Employment in healthcare rose by 50,000, with the bulk of gains taking place within the ambulatory care sector (38K). Although the U.S. economy as a whole produced fewer-than-expected new jobs in November 2018, the Department of Labor reported that the healthcare sector continued to deliver job growth, adding 32,100 jobs and accounting for about 20% of all growth last month. Economists had been anticipating an overall growth of 198,000 jobs. The unemployment rate remained unchanged once again at 3.7%. The October 2018 Jobs Report delivered a stronger-than-expected display of economic growth, adding 250,000 new jobs last month. The healthcare sector contributed to the robust job creation, accounting for 35,600 of the jobs created and the unemployment rate remained unchanged at 3.7%. The report also revealed that wages climbed 3.1% in the past 12 months, the fastest pace in 9 years. While the Hurricane Florence likely impacted the overall pace of job creation in September with the economy adding 134,000 new jobs, the unemployment rate dropped to 3.7% last month. This is the lowest rate since 1969 and is indicative of near-full economic employment. During the month of August, 201,000 new jobs were created throughout the United States and the unemployment rate held steady at 3.9%, according to the latest Bureau of Labor Statistics Employment Report. Job growth spiked within the Healthcare sector, increasing by a total of 33,200 jobs, with 8,200 in the hospital space and another 21,100 in ambulatory care settings. Jobs within the healthcare industry have grown by 301,000 jobs over the course of the last year. The July 2018 Bureau of Labor Statistics Employment Report revealed that 157,000 jobs were created last month and the unemployment rate dipped to 3.9%. While overall job creation was slightly less robust than economists’ expectations, much of the miss was attributed to losses in the retail sector. 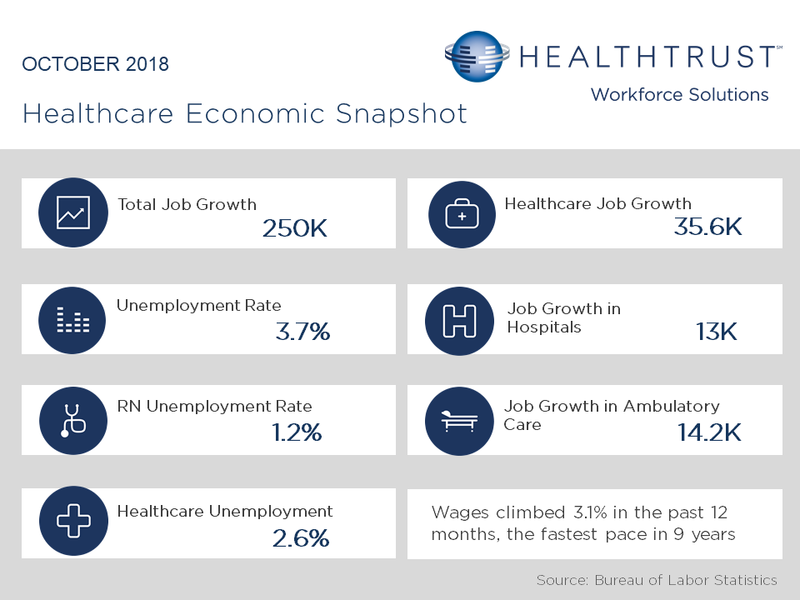 Healthcare added a total of 16,700 jobs last month, with 6,800 in the hospital space and another 9,900 in ambulatory care settings. Over the course of the last year healthcare has grown by 286,000 jobs. The June 2018 Bureau of Labor Statistics Employment Report revealed that 213,000 jobs were created last month, while the jobless rate rose to 4.0% largely because about 600,000 people entered the labor force. Economists polled by MarketWatch believe this indicates that the labor market is very healthy. Healthcare continued to be an economic driver of job creation, adding 25,200 new jobs in June, reaching a total of 309,000 over the course of the year.